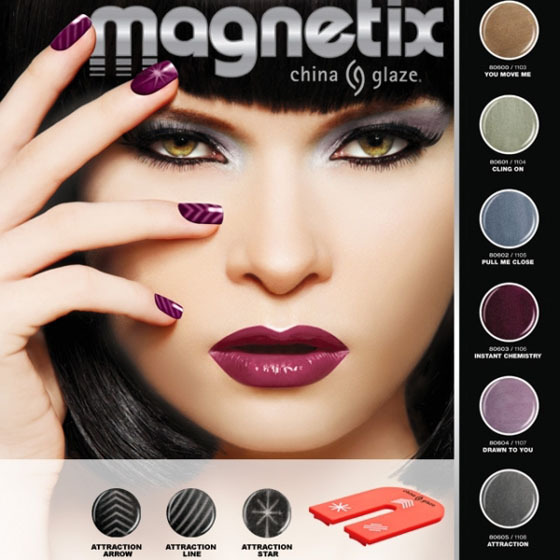 China Glaze is back at it this fall with “Magnetix II”, a whole new collection of Magnetic Nail Polishes and another 3-in-1 Magnet with all new designs. This magnet has a bullseye/circle design, a striped design (straight vertical lines this time) and a square patchwork design. As for the nail lacquers, this collection is much brighter and more vibrant than the original Magnetix Collection which was quite muted. What I love about Magnetix II is that is has a great variety of shades, some are darker where some are super vibrant and rich. So whether you are wanting some fresh new fall shades, or are clinging on to the last moments of summer this collection likely has something for you. You can currently pick up these polishes in store at a Sally Beauty Supply location, at your local salon, or on-line at Ebay. At Sally Beauty Supply, they are $6.99 CAD (magnet sold separately at the same price). Today, I grabbed Bond-Tastic and Con-Fused? but I must tell you that in store I had a super hard time deciding which shades to pick. They are ALL so pretty. And remember, they don’t need to be used with the magnet, so it is always good to pick up a shade you see yourself wearing by itself too. Con-Fused? is a rich emerald green shimmer polish and when used with the magnet a deeper darker shade of green is brought out creating a very cool 3D effect. Whereas Bond-Tastic is a rusty brown/burnt orange shimmer polish with steel grey undertones (this is actually a hard colour to find as a regular nail polish, so this one will be performing double duty for me). The magnet brings out the lighter orange/steel undertones found in the polish. 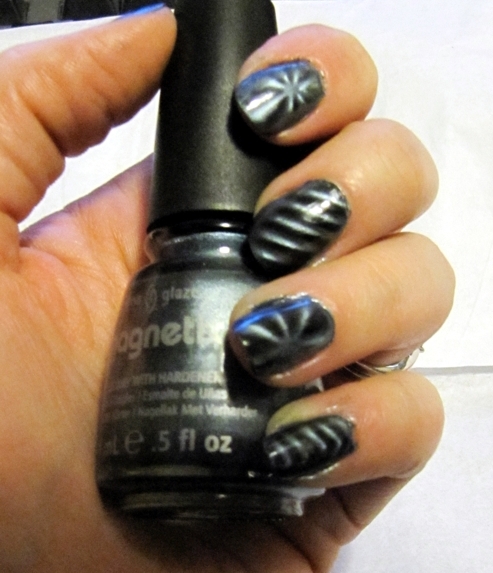 For a full tutorial on how to create these magnetic designs, please click here. Always creates a fun and unique look, the magnets can be twisted and turned to create different patterns every time. The colours in this collection are so pretty, I’d be happy wearing them with or without the magnet. If you screwed up a nail or aren’t crazy about how the pattern turned out, throw on another coat of polish and try again, it isn’t necessary to start from scratch. These polishes are much more opaque than the ones in the previous Magnetix collection. 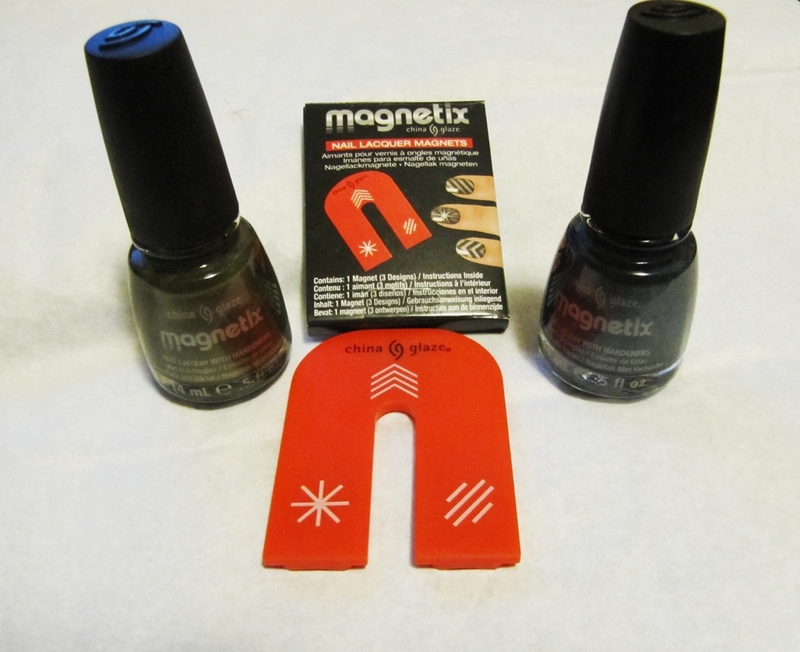 While the instructions have always said to do one coat of polish and then immediately apply the magnet, the original Magnetix Collection was too sheer to get nice results. With Magnetix II though, one coat is all you need. I absolutely love the bullseye design and I found I had the most consistent results with this design. The natural curvature of my nails result in only the centre of the nail changing under the magnet. 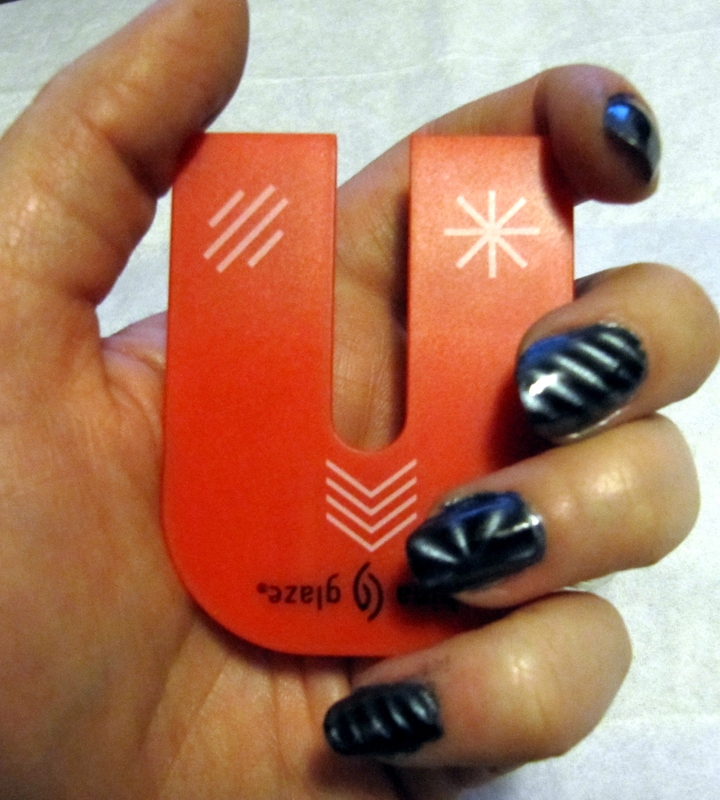 The pattern generally doesn’t reach the edges of my nails (unless I angle the magnet more to one side than other, but then the other side won’t get any design). It takes some messing around to get the patterns to come out nice and clear. I had a hard time getting the patterns to come through as prominent as they show in pictures. You have to hold the magnet as close as possible to the nail, without touching it. I wish the magnets were stronger (which I’ve heard is the case with some other brands). Important Tip: Be fast getting the magnet over your wet nail. 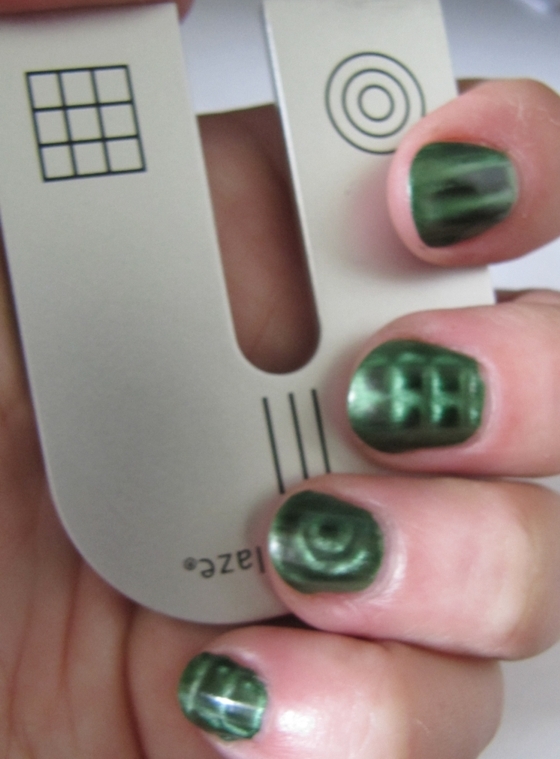 If you take too long, no pattern will appear at all on your nail, or it will be very faint. 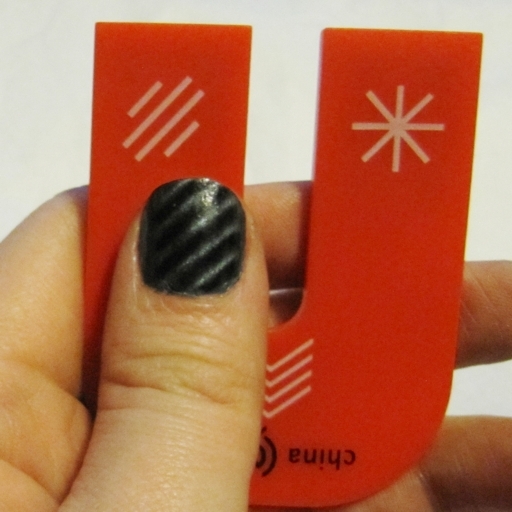 How do you feel about magnetic nail polishes? Are you a fan? I want to hear about your experiences! So, about a week and a half ago I picked up a couple colours from the new Magnetix collection from China Glaze. I got to try them for the first time last night. For the month of March, Sally’s Beauty Supply store has a promotion where you buy two of the colours, you get the set of magnets for free. So for $14, I got two polishes and the magnets. More expensive than normal China Glaze, but certainly a different and unique result too. If you are one of those people that like using a basecoat, this is your first step – GO! 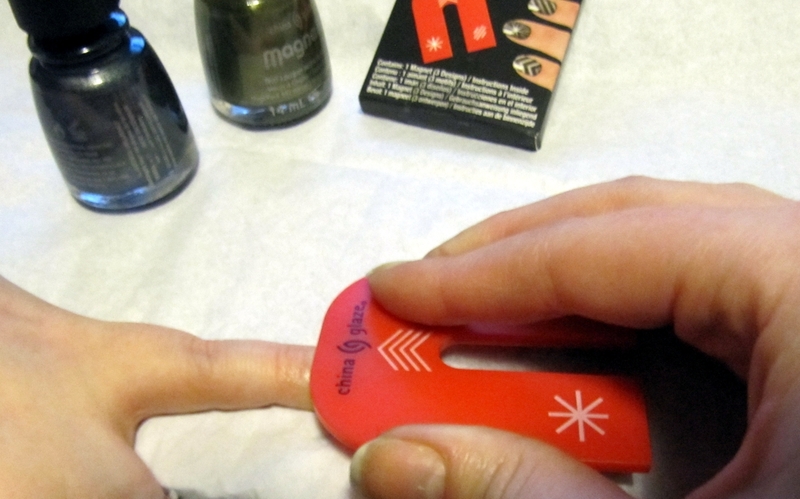 Apply one coat of Magnetix nail lacquer. Let dry. 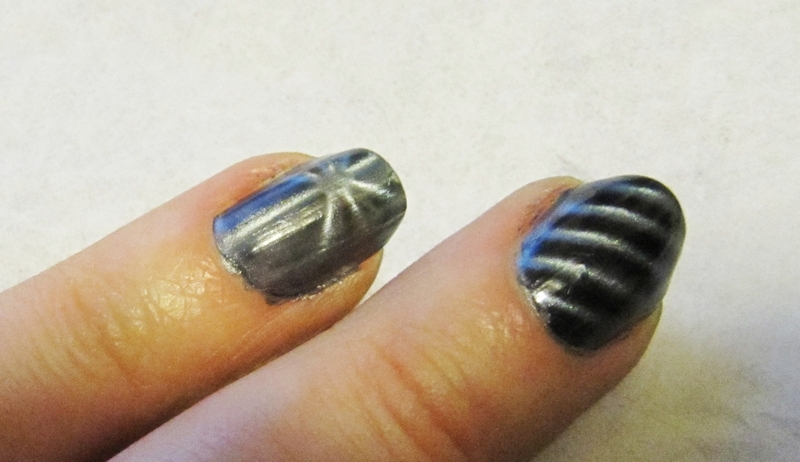 Apply second coat of Magnetix nail lacquer. Even though the instructions only tell you to do one coat, I find your colours are much more vibrant if you do two. In the picture below, the nail on the left is with one coat, the nail on the right is with two coats. You can really tell how sheer one coat is. 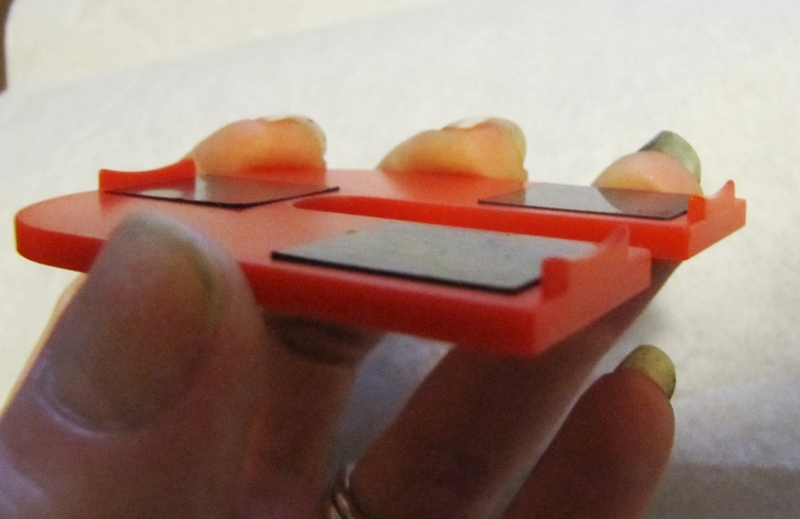 Immediately hold magnet over damp nail. Hold it close without touching your nail for 5-10 seconds. You can see in the picture below that there are little ledges to rest on your finger to help you avoid smearing your wet nail all over the magnet surface. Once nails are dry add your top coat. Enjoy! 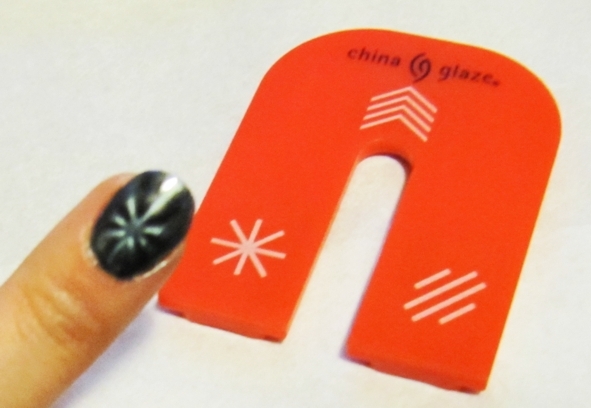 The China Glaze Magnetix 3-in-1 magnet is regularly sold separately. But as I mentioned above, it is currently included at Sally’s with the purchase of two Magnetix Nail Polishes. I found it easiest to have the hand you are working on resting flat on a desk or table. 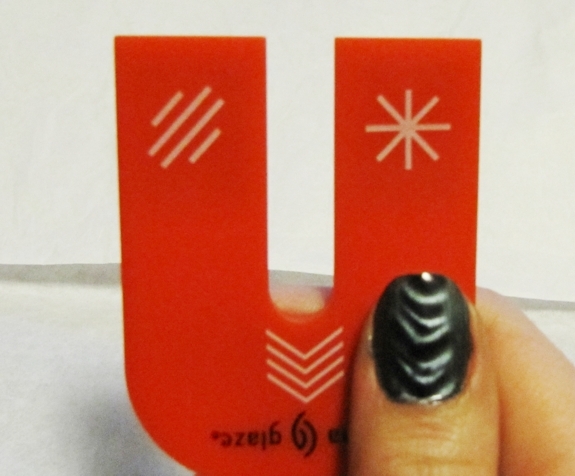 You are less likely to accidentally touch your wet nail with the surface of the magnet. It takes some messing around to get the patterns to come out nice and clear. I had a hard time getting the patterns to come through as clear as they show in pictures. You have to hold the magnet as close as possible to the nail, without touching it and be fast! Don’t dawdle getting the magnet over your damp nail. Remember, all of these polishes can just be used as regular polish as well, so pick out a colour you’ll love for regular use too! Keep in mind, the design sets into the polish as the nail dries. If you pull off the magnet too soon, the nail polish will start bleeding back together and the definition in the design may blur. 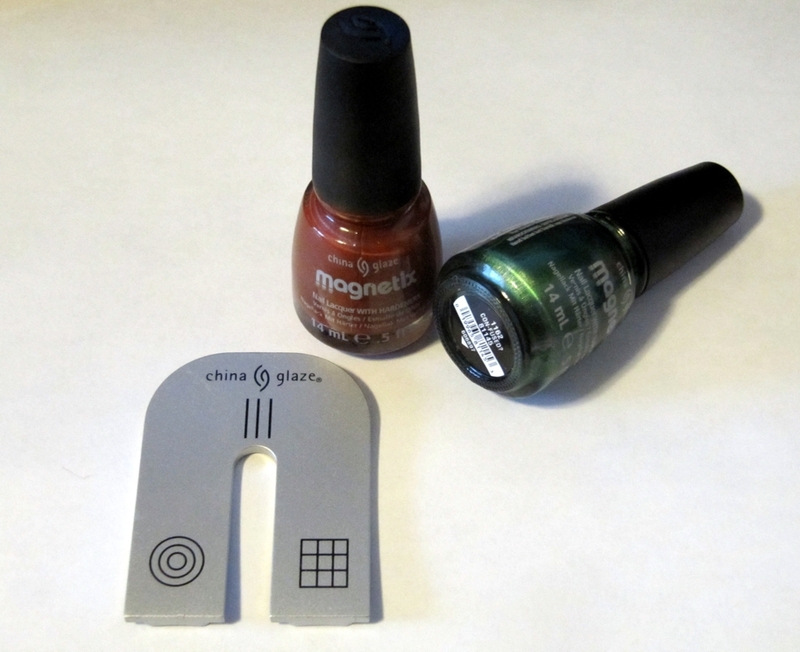 To create different looks remember that you can rotate the magnet, you don’t need to use it the same way each time! Lastly, if you screwed up a nail or aren’t crazy about how the pattern turned out, throw on another coat of polish and try again, it works like a charm. If you are interested in the other Nail Polish Collections for Spring 2012, please click here. 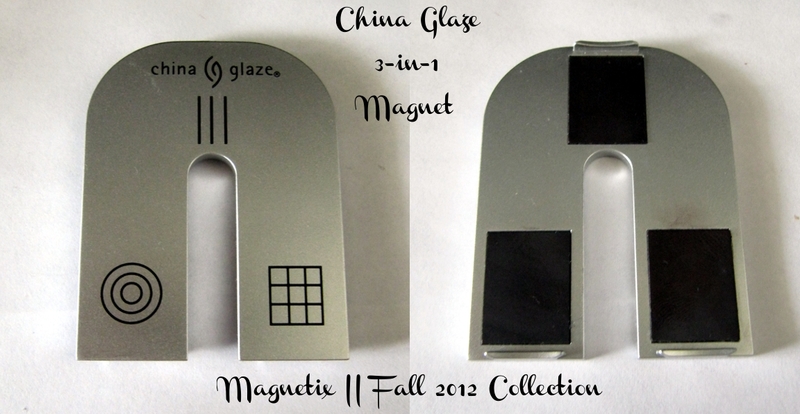 September 16th, 2012 Edit: China Glaze has since come out with Magnetix II a collection featuring all new magnets and new polishes! Check it out here. Thanks for reading everyone – hope you have a great weekend!